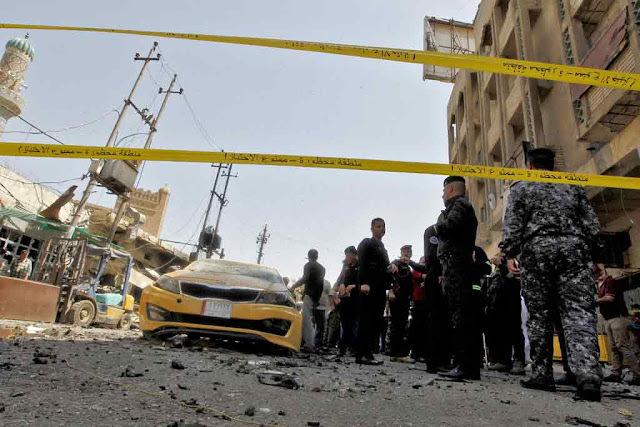 NASIRIYAH: At least 50 people including Iranians were killed Thursday in twin gun and car bomb attacks near the city of Nasiriyah in southern Iraq, local officials said. At least 50 people including Iranians were killed Thursday in twin gun and car bomb attacks near the city of Nasiriyah in southern Iraq, local officials said. The Islamic State (IS) group has claimed responsibility for the attacks. In a statement released by its propaganda arm Amaq, IS group said several suicide bombers had staged the assault on a restaurant and a security checkpoint. "The toll has now reached 50 dead and 87 wounded," Abdel Hussein al-Jabri, deputy health chief for the mainly Shiite province of Dhiqar of which Nasiriyah is the capital, told AFP. He warned that the death toll could rise as many of the wounded were in serious condition. The first attack struck close to a restaurant while shortly afterwards a car bomb targeted a security checkpoint in the same area, officials said. Security sources said the attackers were disguised as members of the Hashed al-Shaabi, mainly Shiite paramilitary units which have fought alongside the army and police against the IS group to the north of Baghdad. The area targeted is used by Shiite pilgrims and visitors from neighbouring Iran headed for the holy cities of Najaf and Karbala further north, although Dhiqar has previously been spared the worst of the violence.